My solution for extracting site activity data from Delicious isn’t going so well (their API is letting me down). 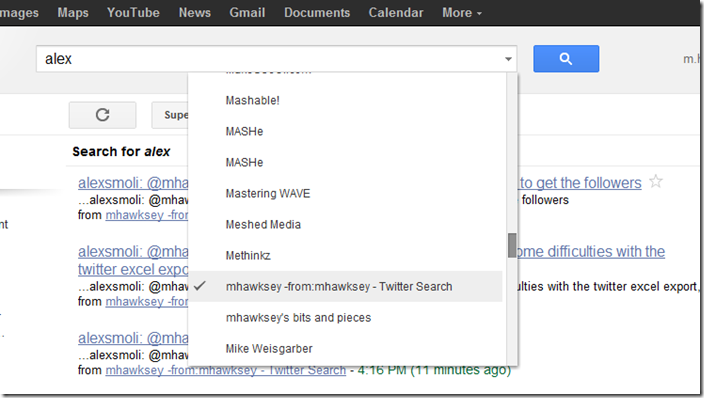 Instead I thought I’d share how I use Google Reader to create a searchable archive of Twitter mentions. It’s not particularly a new trick and you’ll find a number of similar how-to’s so this post is more about awareness raising. To search for those useful links people sent you but you’ve forgot enter a term in the search box and select the feed you just created. I’m not sure how many tweets Google Reader will cache (I’ve seen it mentioned that all are saved) so you don’t have to worry about the usually 7 day Twitter search limit. This solution is also not limited to mentions you can use any search operator you like. Subscribing to RSS feeds in Google Reader is my bog standard way of archiving Twitter feeds. cool – don’t use google reader but might do now I can do this.